Taste of Downtown will be held Friday from 4 to 8 p.m. on the 300 block of Park Avenue, featuring ten local downtown restaurants, bars, and pubs. Arguably, Idaho Falls’ single-best food and beverage event, this is the fourth year for Taste of Downtown. There will be live music provided by Liar & Dan. Guests can watch how different chefs, employees and owners bring everything together and enjoy food right on the spot, said Catherine Smith, executive director of the Idaho Falls Downtown Development Corporation. “This event isn’t just entertaining and delicious, it also gives everyone a greater appreciation for our local cuisine and entrepreneurship right here in our own downtown,” she said. 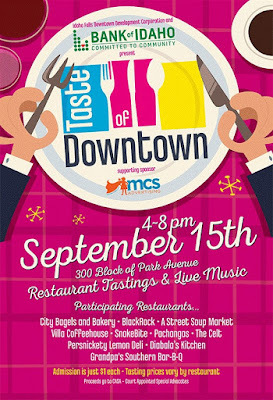 Taste of Downtown tickets will be available at the event. Tickets are $1 each. Participating restaurants include: City Bagels & Bakery, BlackRock, A Street Soup Market, Villa Coffeehouse, SnakeBite, Pachangas, The Celt, Persnickety Lemon Deli, Diabala’s Kitchen, and Grandpa’s Southern BBQ. Each restaurant will set their “taste” amount, or ticket amount, for a variety of dishes available at each booth. Proceeds from this event go to the local nonprofit, CASA-Court Appointed Special Advocates. Taste of Downtown is produced by Idaho Falls Downtown Development Corporation and Bank of Idaho. For more information, check out their Facebook page, https://www.facebook.com/IFDDC/, or visit www.downtownidahofalls.com. Great... The day is my b-day and won't be able to come. And I need it for my work! Who can help with writing an article about it for best essay writing services canada review. I'll need your personal thoughts about the event to write it as an interview (since I can't join). Thank you for sharing! It's nice to see it and the poster is designed beautifully.